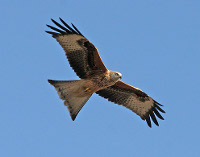 Many years ago, in a bid to help bring a species back from the brink of extinction, several breeding pairs of red kites were released in the Chilterns. Since then, there has been a marked increase in their numbers and it's not uncommon to spot them circling over parts of west Berkshire, especially along the M4 corridor (hmmmmm, plenty of roadkill). In fact, they're so common now, I find it odd not to see one on a clear day circling over the neighbourhood. I think it's pretty amazing to have birds of prey circling over my house and neighbourhood so I always take a moment to watch them for a while, especially when out running. It adds a bit of interest to the run. Anyway, yesterday when I went for my run, I spotted a red kite in the air as I made my way through Maiden Erleigh and watched is circle and glide and generally survey the 'hood. I then watched it grow a pair of metaphorical balls and come right down and check me out. The kite came literally within 2 meters of the top of my head and circled at that height two or three times before retreating back to the loftier heights. It was pretty amazing. This is the first time I've seen a kite come this close to a human. They don't even come this close when I'm standing on the balcony of our second floor flat, so this was definitely a bold one. Either that or I looked like a nice bit of tasty carrion - I'm too big to be a mouse or other small mammal 😉. Actually, come to think of it, the bird was probably on a fact-finding mission. I'm probably a hot topic of discussion in the red kite circles of west Berkshire and he probably just had to get a good look to find out if it was true: does that man in the blue and black jacket really run without any shoes?